Full puckered skirt with rhinestone accents. 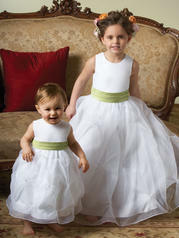 Sleeveless bodice with attached satin waistband and bow. Not available in solid Light Ivory.